by Forster, E. M., Armstrong, Paul B.
Forster, E. M., Armstrong, Paul B. "...In "Howards End" there are, one feels..., all the qualities that are needed to make a masterpiece. The characters are extremely real to us. The ordering of the story is masterly. That indefinable but highly important thing, the atmosphere of the book, is alight with intelligence; not a speck of humbug, not an atom of falsity is allowed to settle. And again, but on a larger battlefield, the struggle goes forward which takes place in all Mr. Forster's novels -- the struggle between the things that matter and the things that do not matter, between reality and sham, between the truth and the lie. Again the comedy is exquisite and the observation faultless. But again, just as we are yielding ourselves to the pleasures of the imagination..., we are tapped on the shoulder....We step from the enchanted world of imagination, where our faculties work freely, to the twilight world of theory, where only our intellect functions dutifully. 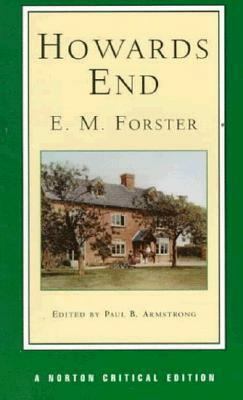 Such moments of disillusionment have the habit of coming when Mr. Forster is most in earnest, at the crisis of the book ..."Forster, E. M. is the author of 'Howards End Authoritative Text, Textual Appendix, Backgrounds and Contexts, Criticism', published 1998 under ISBN 9780393970111 and ISBN 0393970116.